According to statements made by the former director of the FBI during that first meeting with the US president, in which Trump's laborious haircut attracted his attention, both had to address this investigation. One of the complicated points of dealing with the president had been the content of the so-called Steele file, the result of an investigation by former British spy Christopher Steele, funded by the Democratic Party and which claimed that Trump had resorted to the services of prostitutes in Moscow in 2013. Comey said not know if it is true another of the most controversial points of the dossier, which states that Trump urged the prostitutes to urinate on the hotel bed for being the same that had slept in Barack Obama long ago. Former FBI Director James Comey told reporters openly believing that US President Donald Trump is not morally qualified to hold office. Similarly, he said that some aspects of the current Administration remind him of the forms used by the mafia. 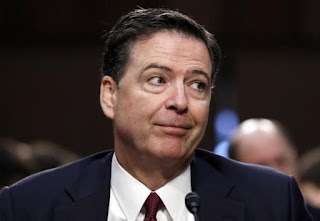 Comey, in an interview with the ABC News channel, said that from his point of view he believes that Trump could be medically qualified to be president, but morally not. Such was the sincerity in the words of the former official when asked his opinion on the possible incapacitation of the president, a topic that in recent months has gained adherents in part of the political class in Washington, which sees the usual outings of tone of the president indications of a possible mental illness. The interview, published in several excerpts over the past few days, has raised great expectations for some of the statements of the former number one of the Federal Bureau of Investigation (FBI), as those in which Comey compares the president with a boss of the mafia. And it is that for Comey, who at the beginning of his career was fighting organized crime in New York, that culture of leadership comes to mind constantly when he thinks about the Trump Administration. For its part, the attitude of the US president to these types of statements has been furious, who has not hesitated to use his personal Twitter account to brand Comey as a snitch, liar and unintelligent. This seems to be just one more episode in the already tense relationship between Trump and Comey, and reached its critical moment in April 2017 when the president dismissed the official by, according to various media, his work at the head of the investigation of the so-called Russian plot. A decision that took Comey by surprise and was interpreted by the American population as a Trump maneuver to end the investigations.